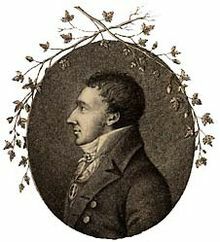 Erik Acharius (1757-10-10 – 1819-08-14), Swedish botanist and lichenologist, and one of Carolus Linnaeus last pupils. Acharius made the first detailed classification system for lichens, and is sometimes called "the father of lichenology". Acharius, E. 1799 ['1798']. Lichenographiae Suecicae Prodromus. : 1–264, pl. 1–2. Mattick Rec.# 31955 – Recent Literature on Lichens BHL Reference page. Acharius, E. 1803. Methodus qua omnes detectos Lichenes secundum organa carpomorpha ad Genera, Species et Varietates redigere atque observationibus illustrare tentavit Erik Acharius., Sect. 1: 1–52, i–lv, 1–152, Sect. 2: 153–393, pl. 1–8. Mattick Rec.# 30921 – Recent Literature on Lichens BHL Reference page. Acharius, E. 1810. Lichenographia Universalis. In qua Lichenes omnes detectos, adiectis observationibus et figuris horum vegetabilium naturam et organorum carpomorphorum structuram illustrantibus, ad genera, species, varietates differentiis et observationibus sollicite definitas. : 1–696, pl. 1–14. Mattick Rec.# 30922 – Recent Literature on Lichens BHL Reference page. Acharius, E. 1814. Synopsis Methodica Lichenum. : 1–392. Mattick Rec.# 30923 – Recent Literature on Lichens RLL (PDF) Reference page. This page was last edited on 28 March 2018, at 13:00.